The mercury is only going one way and that’s not down! 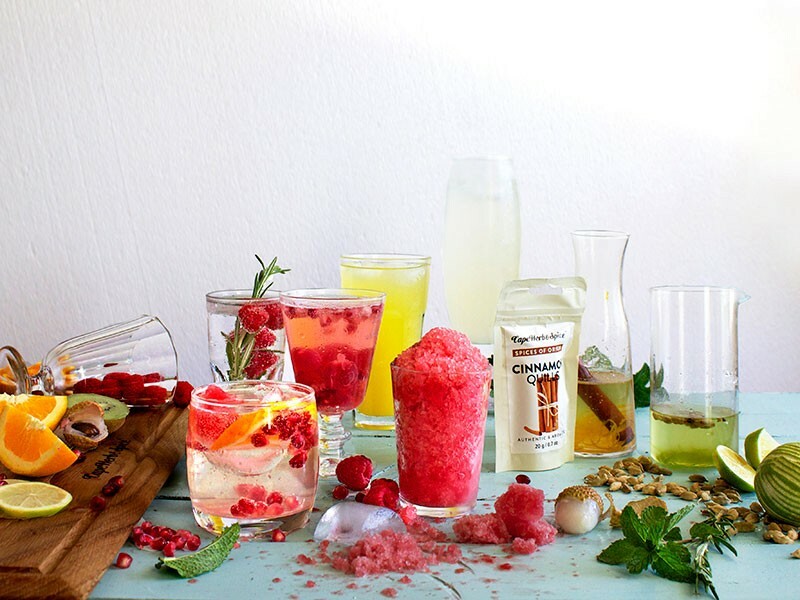 Fortunately that’s the perfect excuse for whipping up icy summer coolers. Loads of ice, fresh fruit, fruit juice and soda water are all you need to create a myriad of delightful coolers. That, and of course spiced sugar syrups made with Cape Herb & Spice Cinnamon Quills and Cardamom Pods. Fill glasses with ice, a generous splash of spiced syrup and about half fruit juice. Then top it up with soda water. Pop in a herb sprig like rosemary or mint. Think litchi juice with the cardamom-lime syrup; orange or apricot juice with the cinnamon-orange syrup. As in food, balance is important when it comes to drinks, so give your fruit juice sparklers extra zing with a squeeze of fresh lime or lemon. A few drops of ginger juice (simply grate it and squeeze) or a some ginger slices to take it to the next level. Liquidise soft fruit along with some spiced syrup and a generous squeeze of lemon juice. Taste to see if it needs extra sweetness or extra acid. Pour it into a ziplock bag and lay it flat in your freezer. Once frozen, remove and use a rolling pin to bash the block of ice into smaller shards. Pop it into your food processor or liquidizer to turn it into fruit ‘snow’. Any fruit with a high water content works well. Fruit in the melon family like watermelon or honeydew works particularly well. You could even add a touch of their neutral veggie cousin in the form of cucumber for an extra refreshing touch. Place soft and very juicy fruits like raspberries, watermelon or pomegranate pips in the bottom of a glass. Use the back of a wooden spoon or pestle to bash the fruit up (also kown as muddling). Add spiced sugar syrup, loads of ice, and top it with either just soda water or a mix of soda water and lemonade depending on how sweet you prefer it. A slice of lime or lemon and a sprig of mint or rosemary and you’re done. Any of these coolers can be made into a more adult version by adding a tot or two of a neutral white spirit like vodka. Recipe concept & photography by Lizet Hartley.